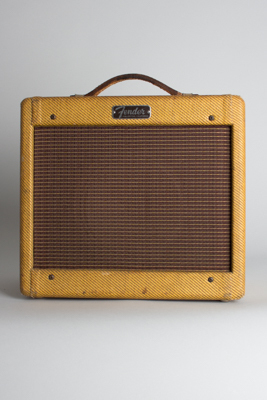 Fender Champ-Amp 5F1 Model Tube Amplifier (1962), made in Fullerton, California, serial # C-18575, tweed fabric covering finish. Height is 12 in. (30.5 cm. ), 13 1/2 in. (34.3 cm.) width, and 8 in. (20.3 cm.) deep. This is a solidly original late-period tweed Champ, just maintenanced and sounding great. Service included replacing the electrolytics and two coupling caps (the original caps were failing), and the amp was rebiased to spec for a NOS 6V6 power tube. No circuit changes have been made, in fact this amp appears to have never been serviced at all until recently. It has a tube-chart stamp dating to early 1962 and retains the original transformers and speaker. Externally the tweed is somewhat dirty but not heavily worn, the original handle still intact and the faceplate has minor corrosion with some loss to the faceplate graphics but is not hugely worn. Another great-sounding champ, a midget in size but a monster of tone! Excellent - Condition.